I know I'm not the only one who is a fan of easy weeknight meals. There is often nothing less exciting after a busy day than waiting in long grocery store lines and then trying to come up with something healthy and delicious to make for dinner. I like to think that I'm pretty prepared, and getting into weekly meal planning has really helped with that, but there are still many nights when I'm tired and uninspired. 1. 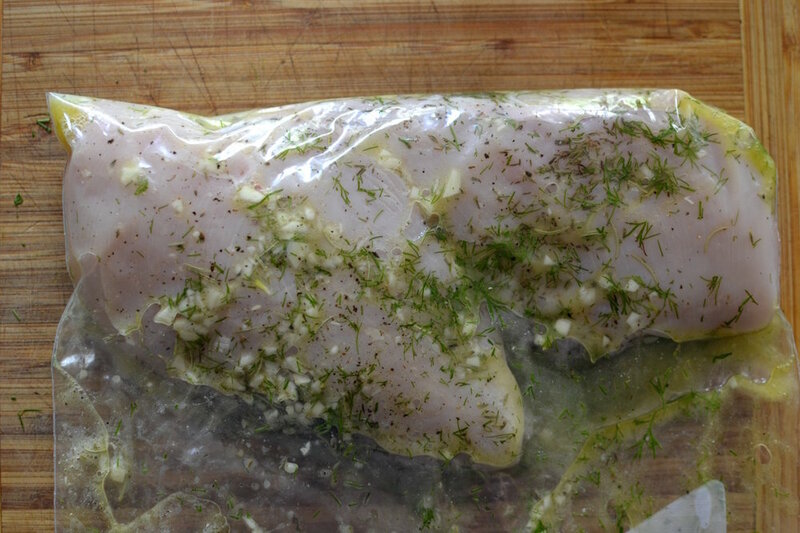 Put all of the ingredient into a freezer-proof Ziplock bag. Yes, the prep is that simple. 2. Seal the top of the bag and mix all of the ingredients around. If you're eating these on the same day, marinate for at least eight hours. Otherwise, throw the bag into the freezer and leave them there until the night before you're going to eat them. 3. Heat a small pan with coconut oil or butter at a medium high heat. Once the oil is hot, drop the chicken into the pan. With the oil at a high heat, the outside of the chicken will get crispy but the inside will not. 4. Once the one side of the chicken is crispy, flip the chicken and wait until the other side is crispy. Once the internal temperature of the chicken reaches 165 degrees Fahrenheit, take the chicken off the heat and rest it for a few minutes. Slice up the chicken and enjoy with sides of your choosing. On this particular evening, I had baked yams and steamed broccoli. I've been trying to incorporate more veggies into my diet, so I find creating two different veggie sides for my dinner has been a big help in that. The lemon and the spices give the chicken such a wonderful light flavour that pairs well with so many different sides and ingredients. Though I think the flavours work best in the summer, it's a dish you can make all year, and make for as many serving sizes as you need. What are your favourite easy weeknight meals? Are there things you go back to time and time again or are you always trying to find something new?